Hey guys! 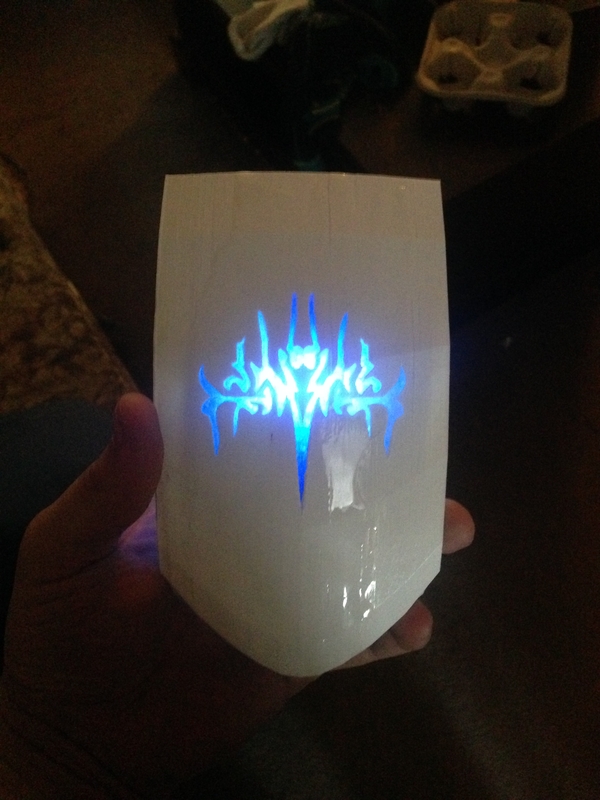 I've been working on a set of costume armor that I've slowly been 3D printing the bulk of. I'll be building up much of it with Sintra/foam, but as there are large portions of it with some very intricate runes, I've opted to have my crappy little Prusa knockoff print those particular pieces out. I'm having a hard time working out how to achieve the effect I want on it, however. I don't have a large budget, so that limits me quite a bit, but the biggest hold-back I'm having are the lights and the paint. You see, I want to have the final product be smooth, with the runes completely hidden beneath the paint, so that the armor looks completely smooth and the runes are invisible. When I hit a hidden button, I want lights to fade on, making the runes glow a bright blue and be seen despite the paint. I'm printing with PLA, which is about the only thing my printer can do right now (especially since it sits next to my desk - ABS fumes make me dizzy). Normally I'd coat the PLA with fiberglass resin for strength and to keep it from warping in any heat, but that dries yellow and would affect the color of the lights. 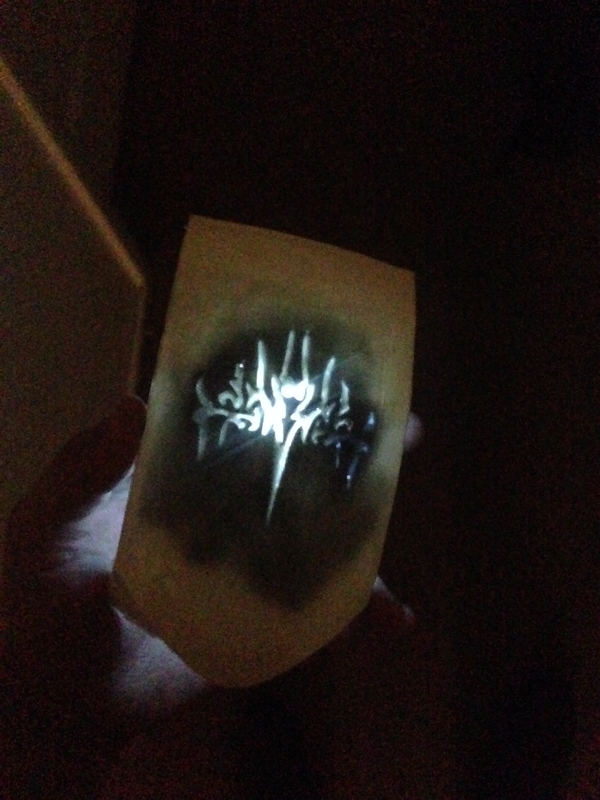 I've done a couple simple tests with a clear epoxy resin, Envirolux Lite, but that takes forever to set and even then is kinda runny, and since many of the pieces are curved it tends to seep out of the runes and drip down, which kills the flat, smooth effect. It did do the effect I wanted though, at least with a simple LED flashlight and with painter's tape still on the back (see pics). Of course, then I tried out a basic airbrush paint which I did a light coat of over top. The light barely showed through at all, though in a darker room it was decent. So: advice on products like Envirolux that dries solid and clear but doesn't run off as much? Or suggestions for applying it so that it ends up even, or at least even enough that I can sand it smooth without affecting the lighting? And what would you guys suggest for paints? I'm going for either a brilliant silver or brightened steel look. For the epoxy coating, brushing on multiple thinner passes may help a bit with the material not settling the way you want. There is also a product by Smooth-On called "XTC-3D" which is designed for coating 3D prints, but it too is a low viscosity self-leveling epoxy. It may also not be in your budget, since I know their products are a bit more expensive some times. For lighting the runes there are a few things you can do to get better results. One is to mask off the runs and paint the armor first, then mask of the armor and lightly mist the clear runes. After that you can remove the masking and lightly mist again to blend things. The idea is to not fully cover the runes with paint, but to coat them in with more of a fog of tiny dots. When the runes are covered from the back (with no ambient light able to shine through) they should be less visible. And when lit by bright LEDs they should stand out. You're headed in the right direction with your testing, just keep at it! Now my biggest issue is attaching the visor. I'm having a hard time working out a mechanism that will work to move the visor up and down (a la Iron Man) that is mostly hidden. Pretty much all of the mechanisms I've found rely on the flat sides of the Iron Man helmets, but my helmet and visor are both very curved. I've thought about various types of hinges, tried to work out a pulley system, even tried to work out a gear system, to no avail. Would anyone be willing to take a look and possibly help me work out some kind of mechanism for this? 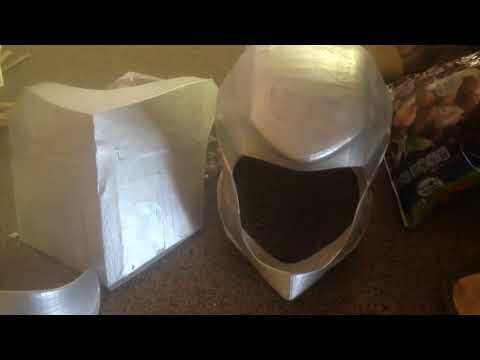 Otherwise I'll have to fully secure the visor to the helmet which, though it'll work, won't be nearly as cool lol. Looking great Matthew! Can't see the runes at all until you backlight them. As far as the visor goes, that does sound super challenging. I've not done a moving visor yet, so I doubt I can offer too much help. But I'm curious to see what you figure out!